Now that the summer is upon us, there is no better time to be on the lookout for the signs of dehydration among the elderly. Seniors are at a greater risk of dehydration than younger adults for a number of reasons. Their bodies simply need more water on a daily basis, they may have chronic issues that can make them reluctant to drink and many seniors are on medication that can actually cause dehydration. While dehydration can happen at any time, during any season of the year, especially in seniors, it is the most prevalent during the summer. If you are looking after a senior loved one, then it is essential that you know how to prevent, detect and treat dehydration in elderly adults as it can go a long way in helping keep them safe and healthy no matter what weather may be like. 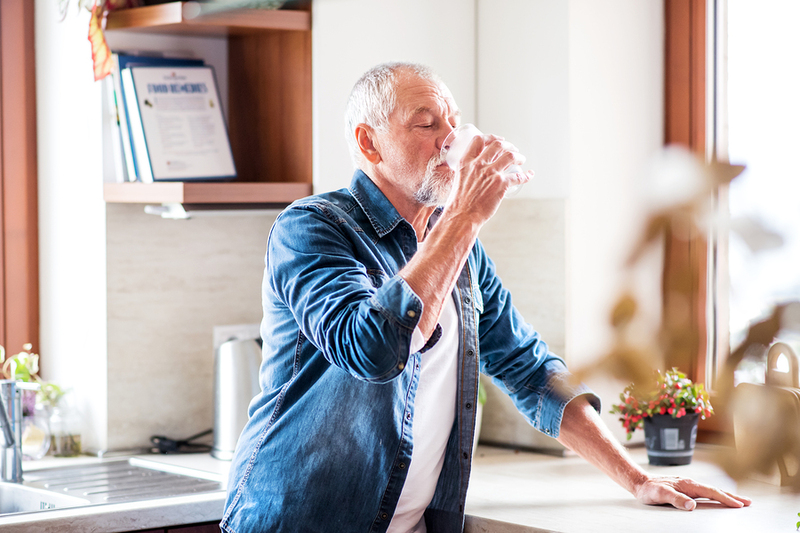 The first and most important thing to remember when it comes to keeping seniors hydrated is that drinking enough water is the first line of defense. It is recommended that seniors drink between 7-8 cups of water every 24 hours in order to stay hydrated. In addition to drinking water, seniors should avoid sugary drinks, sodas, coffee and alcohol—all of which can actually dehydrate the body. Seniors who engage in strenuous physical activity or who are sweating from being outdoors in the summer heat should drink even more water. Steps to prevent dehydration are important, and they are the best way to make sure that seniors don’t fall victim to dehydration especially during the warm summer months. However, it is just as important to make sure you are able to detect the early signs of dehydration and get your senior loved one help, should they need it. The earlier you are able to help your senior loved one the better. Remember, dehydration in seniors is a serious problem and is one of the leading causes of hospitalization in seniors. These are all signs that your loved one needs more liquids in their system and may be dehydrated. Dehydration is treated in different ways depending on whether the dehydration appears to be mild, moderate or severe. Mild dehydration is typically treated by the individual taking more fluids in by the mouth. Typically, this means drinking water and something with some electrolytes like a sports drink. Moderate dehydration is typically treated with intravenous hydration or IV therapy. This can be done in a hospital, emergency room or in urgent care. There are some nursing homes that also have infusions and IVs available. Severe dehydration may require additional support along with IV therapy to support kidneys that may be struggling from severe dehydration. The more you know about dehydration in seniors, the better. It is extremely important that all senior caregivers are aware of how to prevent, detect and treat dehydration so that they can continue to keep their loved ones healthy and hydrated.